There’s something about seeing– experiencing– a thing first-hand that is more compelling than having someone tell you about it. Philip was prepared to tell his brother Nathanael all about Jesus, but this wasn’t enough to overcome his brother’s suspicion or cynicism. Philip’s response was an invitation to come and see for himself. 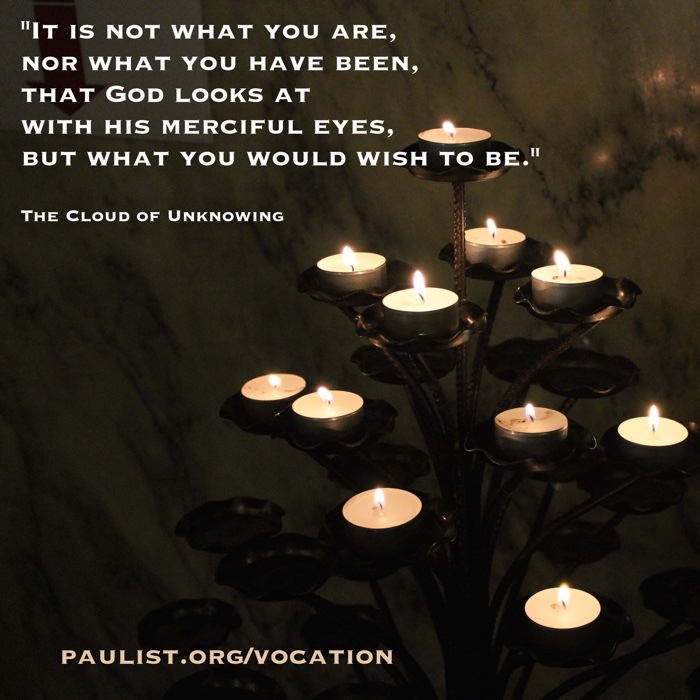 When a man is contemplating a vocation to the priesthood or religious life, most of the discernment is internal work: prayer, reading, prayer, spiritual direction, and prayer. This is a good and necessary process. But it can also feel a bit isolating, as if no one else is wrestling with these issues and questions. And it can also take on a hypothetical and imaginative quality. What will life in the novitiate be like? Is the seminary a strange place where I’ll feel uncomfortable? Will I be out of place, surrounded by people who are so much holier than I am? Can anything good come from Nazareth? Come and see. That’s the invitation that the Paulist Fathers make three times each year. Come for a visit. See and experience our common life. Pray with us. Dine with us. Come to class. Come to the chapel. Have a soda or a beer, and ask your questions. These come and see weekends (and the annual Paulist Plunge at St. Mary’s on the Lake in Lake George NY) are a chance for prospective vocations to get an extended look at the community, and see if they feel like we’re a good fit. (And, of course, they are an opportunity for the Paulists to make the same assessment!) Fears about what the seminary might be like can be replaced with facts and informed perspectives. Relationships can be forged with seminarians and other inquirers. And through all this, the Holy Spirit can work to deepen one’s insight into the nature of vocational discernment. Inevitably at the conclusion of these visits, some participants will tell me, “This was a great experience for me, and I’m so grateful for the Paulists’ hospitality. I feel like I’m being drawn in other directions, but I’m glad I came.” This is good news: it means the process of discernment is working to bring clarity! To realize, “this isn’t for me,” is fine, and we thank God for the clarity. But there are also men who tell me at the end of the visit that they’d like to continue the conversation, and work toward applying to the Paulist novitiate. This is also cause for rejoicing! In either case, I know that those who come and see are drawing closer to God and deepening their discipleship. If you (or someone you know) would like to attend the next Paulist Fathers Come & See Weekend or Paulist Plunge, please contact me, and we’ll set it up. If you’d like to help support Paulist Vocations by underwriting the cost of these events or sponsoring a prospect’s visit, contact the Paulist Fathers’ Development Office— they’ll be glad to assist you.